Pathos and its innovative InPol amplifier circuit has been around for some time – in fact, the Inseguitore Pompa Lineare circuit was patented by Pathos back when the company was founded in 1994 – but its use has mainly been in integrated amplifiers and power amplifiers for the traditional two-channel loudspeaker world. The InPol Ear represents the first time this unique hybrid circuit crosses over into the headphone world – and the results are outstanding! The term Inseguitore Pompa Lineare translates to ‘Linear Pump Follower’, and the amplifier uses a triode valve to amplify the input signal voltage, and a discrete fully-balanced Class A solid-state follower circuit designed to deliver high current and unity voltage gain to the loudspeakers. Effectively, it means the performance of that input signal and the valve driving it entirely defines the output characteristics of the solid-state amplifier powering the loudspeakers or, in the case of the InPol Ear, headphones. In theory, this should increase the efficiency of a Class A amplifier while also delivering power with optimally low output impedance. A recent innovation by Pathos is the ‘double InPol’ circuit, which is pretty much self-descriptive, and balanced operation throughout is handy for both input and output for any headphone amplifier. 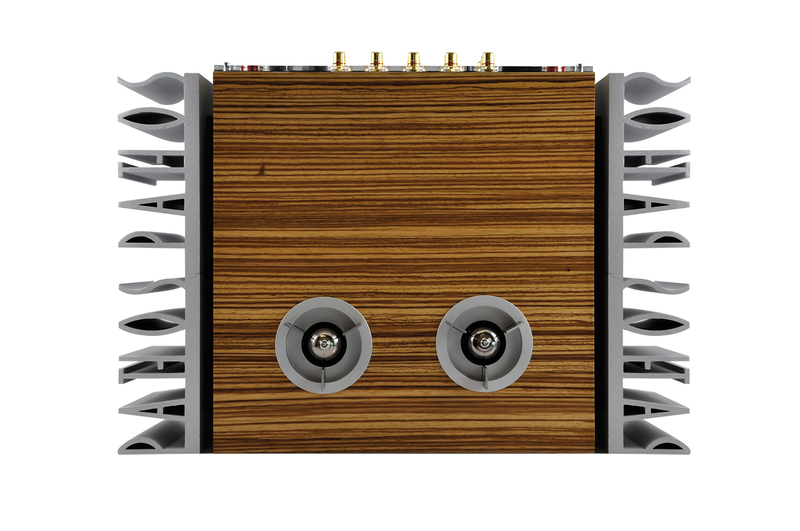 In essence, Pathos has built an amplifier designed for loudspeakers in headphone-sized form. This means the InPol Ear has some extremely impressive specifications, like the ability to deliver up to 10W into a 32Ω headphone load. Put another way, if you could attach a headband to a pair of bricks, the InPol Ear would get a tune out of them. Whether in balanced or single-ended output, the amplifier is simply not going to be phased by any headphone load in existence. On paper at least, this is extremely impressive. The rest of the circuit design is no less significant. That volume control, for example, is actually a digital volume controller, a Burr-Brown PGA3210, to give far greater precision over channel accuracy and volume setting (it has a range of 180 half-decibel steps). The base of the front of the InPol Ear forms the basic controls, as well as a large red LED volume display, a ¼” jack and two four-pin XLRs for balanced operation. There are four single-ended, and one XLR line inputs, as well as a XLR and single-ended stereo output for those wanting to use the InPol Ear as a preamplifier. I would suggest this last option is relatively limited in reality, because its function as a headphone amplifier (with optional DAC) is paramount, and its secondary function is almost legacy by comparison. Alongside clever circuitry, Pathos is known for its extremely elegant industrial design, and the InPol Ear is no exception. Italian companies – be it audio brands, car marques, watch-makers, furniture designers, or practically anything else – build their products with style, and Pathos more than lives up to the reputation. The company has an innovative way of dealing with the necessity of heatsinks, by making them the company logo; the name is written along the sides of the amplifier in a stylish, almost Art Deco font. The front and top plates are finished in one of four finishes (three solid colours, one tree-related). At the top of the amplifier are two exposed EH 6922 double-triodes, recessed and shock-mounted in a trio of aluminium plates, and the large volume control is similarly recessed into the front of the InPol EAR. This not only looks great, but is stylistically reminiscent of Pathos designs both current and classic, and the InPol Ear is very much part of a family in look, and sound.